All five of the Best Picture nominees were made outside of the established Hollywood system - and all five of the nominees shared in the top prizes (12) this year. 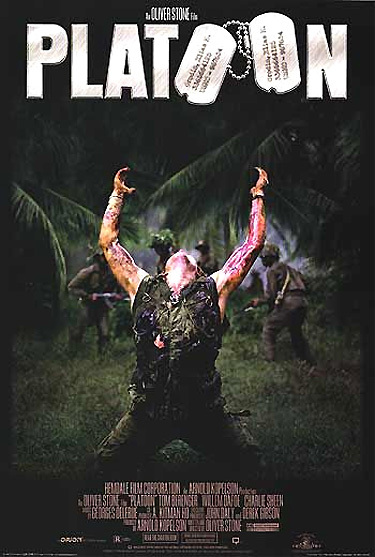 The harrowing film, from a grunt's point-of-view, was based on director Stone's own tour of duty in Vietnam, and focused on the conflict and struggle between two major father figures: an 'evil' Sergeant (Berenger) and a 'good' Sergeant (Dafoe), over the soul of an innocent, young recruit (Sheen). Oliver Stone won the Best Director Oscar - it was his first Best Director Oscar. [He later won a second Best Director Oscar for his Born on the Fourth of July (1989).] Stone also had two Oscar nominations in the same category, Best Original Screenplay, for two different films: Platoon and Salvador. Both lost to Woody Allen's Hannah and Her Sisters. As stated earlier, Children of a Lesser God was the first female-directed film ever to be nominated for Best Picture. However, the female director Randa Haines, with her feature film debut, was the only director of a Best Picture-nominated film who was not nominated for Best Director. [The fact that she was overlooked - and that only one woman up to that time had received a Best Director nomination - Lina Wertmuller for Seven Beauties (1976) - was interpreted as sexist.] Her place was taken by two-time director nominee David Lynch for Blue Velvet, the disturbing mystery about the seamy underside of small-town American life. The Best Actor award was won by Paul Newman (with his seventh nomination and first win) in a reprise/remake of an earlier role from The Hustler (1961) as an older pool hustler 'Fast Eddie' Felson - now manager of his pool-heir apparent (Tom Cruise) in director Martin Scorsese's sequel The Color of Money (with four nominations and one win). The award was a dubious honor - it really represented praise for his entire career's work of great performances, mostly for his colorful non-conformist roles in numerous films. 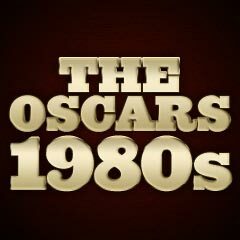 Chuck Workman's Precious Images won the Oscar for Best Live-Action Short Film, which was a focused montage of classic film moments from the early 1900s to the mid-80s - found in over 450 clip segments. This film would make him a perennial Academy Awards favorite as a contributor of movie montages. Eccentric David Lynch's director-nominated film Blue Velvet was only nominated once for Best Director - and Lynch lost. Although Dennis Hopper was nominated in the same year for his supporting role as Shooter - the father of a small-town basketball player in Hoosiers, his scary, moving performance as abusive and sadistic psycho Frank Booth in Lynch's film should have been nominated instead. Isabella Rosselini was also un-nominated for her fearless role as the victimized soulful lounge singer Dorothy Valens, masochistically-linked to the obscenity-spewing, velvet-fixated, nitrous-oxide inhaling Frank. Oliver Stone's film about American involvement in Central America titled Salvador wasn't nominated in two major categories - Best Director and Best Picture. Rob Reiner's coming-of-age drama Stand By Me, based upon Stephen King's short story about four young males who adventurously sought a dead body in the woods over a two-day period, received only one nomination - for Best Adapted Screenplay - this obviously neglected the acting performance of River Phoenix as Chris Chambers. Director Michael Mann's Manhunter went completely unnominated, for Best Director, Best Cinematography (Dante Spinotti), Best Actor (William L. Petersen as Will Graham), and three Best Supporting Actor nominations: Tom Noonan for his frightening role as Frances Dolarhyde (The Tooth Fairy), Brian Cox's brief role as a convincing Dr. Hannibal Lektor, and Stephen Lang as tabloid reporter Freddy Lounds. And Carly Simon's "Coming Around Again" was not amongst the nominees for Best Song, in Mike Nichols' box office failure Heartburn (with no nominations), starring Jack Nicholson and Meryl Streep. The category was won by Top Gun's "Take My Breath Away."